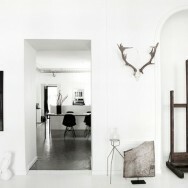 Grey, black & white set the monochrome colour scheme in this Danish apartment. 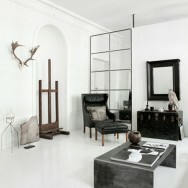 Being decorated with an elegant flair it breathes out both a Nordic minimalism style and a Parisian showroom set-up. Polished concrete floors, stale framed windows,... You've got to say, this cool industrial apartment has been softened up by the mix of raw materials, well choosen furniture, an impressive chandelier and Kate Moss framing one of the walls. 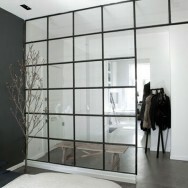 A place to feel at home, to feel inspired and relax at the same time!